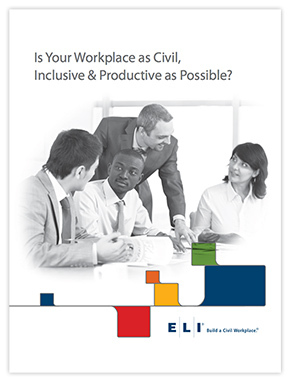 Read the latest perspectives from ELI® on trends and best practices for building a civil, inclusive, and productive workplace culture. (2016) Ready to learn more about what Unconscious Bias is, and how it can affect your workplace? 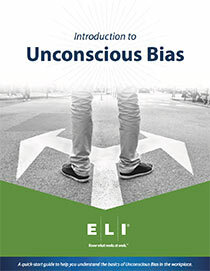 The Introduction to Unconscious Bias provides an overview of Unconscious Bias, explores what it is, provides real-world examples of unconscious bias and helps to explain what you can do about it. How Trustworthy is Your Workplace? (2014) Values and trust inside an organization are the keys to its success, and the employee’s viewpoint is the most credible source when it comes to learning the internal values of a company. 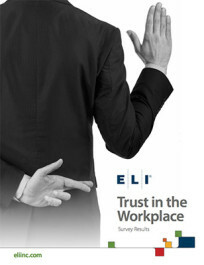 We understand this at ELI, so we conducted a Trust in the Workplace survey, asking internal employees to explore the issue of trust in their workplace. (2014) Your organization needs to juggle an increasing array of business needs in order to succeed – and one of these is the need to better capitalize on human potential. In today’s fast-paced world, many factors that used to convey a competitive advantage no longer do. But one universal truth hasn’t changed: Your employees are what make or break you in a competitive market. How people are trained, treated, retained, and utilized is crucial in virtually all marketplaces. 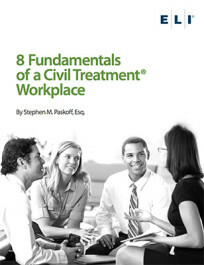 This white paper will discuss the 8 fundamentals necessary to capitalize on human potential and create a Civil Treatment Workplace. 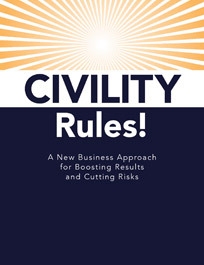 (2013) This eBook focuses on workplace behavior and culture within an organization. Many companies spend their energy focusing almost exclusively on preventing illegal behavior, which is important – but it’s not enough. 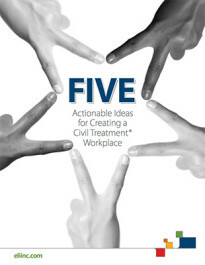 They need to create a Civil Treatment Workplace. (2013) We’re connected with people from all over the globe but that doesn’t mean we know a whit about them, their cultures, their beliefs, or how they work. Complexity is increasing. Tools to simplify information, make it memorable and lasting, are not keeping up. If we want to bring people together in the workplace, minimize risk, and increase productivity, we can’t assume that the latest technology will help us. Unfortunately, it may have the opposite effect. 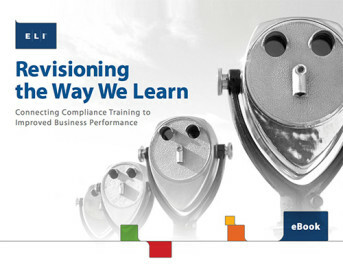 Sometimes more technology and more content are a recipe for worse compliance results. (2013) Situations can quickly deteriorate and the harm can be immediate and long lasting, personal, and organizational. By attuning everyone to the imperative of speaking up, we can help avert catastrophes from causing unnecessary and, all too often, irreparable damage. 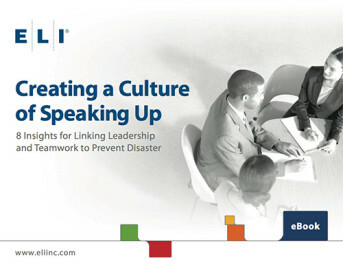 With a teamwork focus on uncovering and repairing problems, speaking up becomes a valued element of organizational citizenship and performance excellence. 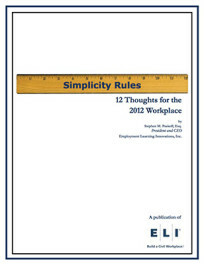 (2012) Are you overwhelmed with the countless policies and regulations that swamp today’s workplace? If so, you’re not alone. The answer is a few simple principles that apply to every professional situation and can ultimately transform your workplace behaviors.